Are screens and keyboards harming our kids? Last December, my then four-year-old-son decided to build Paris at home using cardboard boxes, construction paper, crayons and glue. Naturally, I thought it was a masterpiece worthy of the Louvre itself. But 24 hours later, his city of light and imagination was obsolete. My dreams of a future architect evaporated. I blame tablets, and here’s why. The next morning, we had to go to the hospital for a scheduled procedure. As he lay in the bed waiting, a nurse handed him a gleaming iPad to distract him. After 30 seconds of instruction he was engrossed in Angry Birds and barely fl inched when the nurse inserted an IV. He took the iPad to the OR and clutched it until the anesthetic took hold. Two hours after the procedure he was dozing in a recovery room, then suddenly bolted awake as if I’d smacked him with smelling salts. “I want my iPad!” he hollered. A nurse came in to check his vitals. “Well, young man, you’re doing great,” she smiled. “Who took my iPad?” he responded. I began to apologize for his impudence, but she shrugged, “Oh honey, that’s for patients before surgery.” My son was an addict after just one hit. Like many Canadians, our family is navigating through a world rife with interactive videogames, TV, smartphones and other handheld devices. This is our new reality. As parents, we are adapting to technology while our children are absorbing it by osmosis. No adaptation required. 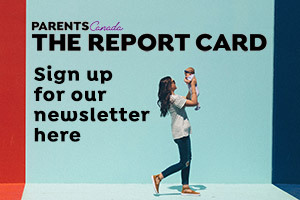 According to an online survey of parents conducted by ParentsCanada, approximately half of children ages two to 14 – 49.9 percent – have access to a mobile device such as a portable tablet, smartphone or handheld device. Of those 1,250 respondents, almost one in fi ve said it was OK to introduce these devices between ages two to five. Only 6.3 percent were prepared to let their two- to fi ve-year-olds use technology unsupervised, and 8.5 percent of parents would buy or had purchased these types of devices for their preschoolers. I’m no Luddite; I make my living on a laptop and conduct interviews on WhatsApp. I make dinner plans with friends via text. It’s not just me – there’s a multitude of messaging going on in this country. In a June 2012 report, the Canadian Wireless Telecommunications Association noted that Canadians sent 267.8 million texts a day. In 2005, the monthly average was 4.1 million. We’re the world’s heaviest Internet users, individually spending more than 45 hours a month online, according to the Canadian Internet Registration Authority. That amounts to 22.5 days a year when we are inert, parked in front of a screen, when we could be socializing or moving and shaking outside. It makes me wonder, is this having an impact on our children? “We’re substituting connection for conversation and adolescents would rather do that. But developmentally, they’re missing out,” Sherry Turkle, a clinical psychologist and founder of MIT’s Initiative on Technology and Self, told U.S. broadcaster National Public Radio last fall. She cautioned that ongoing exposure could interfere with a youngster’s ability to reason and strategize. Indeed, despite expert recommendations to limit screen time to two hours a day, children ages five to 18 are spending almost eight hours a day on screens (portable devices as well as TV). “If you multiply that by seven that’s more than their parents spend at their jobs,” says Kelly Murumets, the President and CEO of ParticipACTION. “It’s unbelievably alarming and, in some ways, surprising because if you think about kids, it’s in their DNA to run, jump, to tumble, to play.” No wonder so many kids resemble gigantic Kinder Eggs (approximately 26 percent of Canadian kids aged two to 17 are classifi ed as overweight or obese). Being constantly connected has been linked with attention issues. Researchers at UCLA are seeing signs of emotional dependence on digital devices and subsequently, increased anxiety. I’ve had spirited discussions with my husband (he works at a Fortune 100 tech company) about the right time to introduce an e-reader or tablet or iPhone. I needed to know how young is too young to have access to such sophisticated technology. I know our son, who just celebrated his sixth birthday, has the rest of his life to master mobile devices. My husband feels we can’t shield him forever. (We agree that motor skills are crucial. A study by AVG, a global security software maker, found that 19 percent of kids aged two to fi ve can work a smart phone versus only 9 percent who can tie shoelaces. To be fair, it’s easier for inexperienced fi ngers to swipe a screen than to thread laces.) We are divided. Family dynamics began to shift about two decades ago when consumers bought the second home TV. Portable cell phones made media exponentially accessible and, some would argue, began to disconnect us from each other. Michaela Wooldridge, clinical supervisor for a home-visiting early intervention program in Vancouver and a PhD student at the University of British Columbia researching how technology affects infant and toddler development, says we’ve not understood our children’s mental health or psychological and developmental needs. But ParticipACTION’s Kelly Murmurets says, “there is absolutely no data that talks about the benefi ts of screens even from the learning perspective.” There is evidence for gradual benefi ts as children age (older than three) but that depends on the quality of programming, design, and adult mediation to distinguish it from entertainment, says Michaela. It’s been a year since my son laid eyes on that iPad, and he’s forgotten all about it. Recently a friend gave him a wooden model car. Our enchanted boy spent two days gluing, painting and decorating it. Then he asked if we’d buy “another wood toy so I can create a car.” For now, our kid doesn’t need batteries or WiFi to ignite his imagination. In her spare time Amber Nasrulla Googles top-notch design schools for her son.